Microsoft has announced the completion of missing key capabilities within Teams, that finalise the Skype for Business to Teams roadmap. Work gets done when individuals connect, communicate and collaborate seamlessly and with ease. Meetings represent over 1/3 of the average work week, yet over 60% of meeting attendees say they need more from their meeting experience. 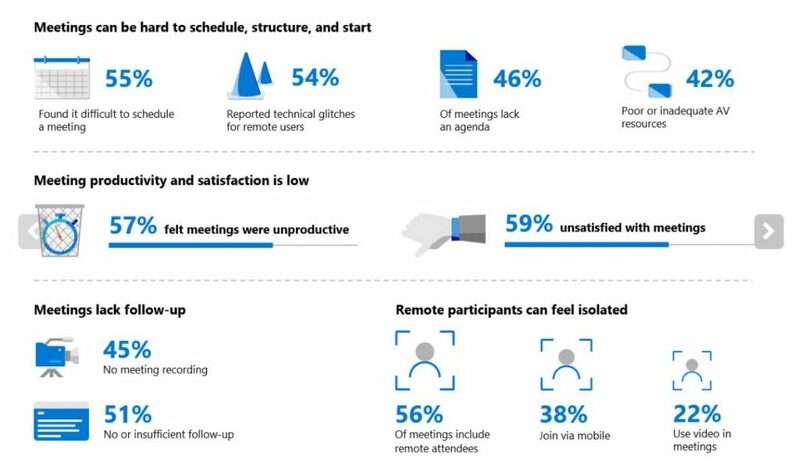 No matter where in the world a user may be, the recent investments made in Microsoft Teams meetings will streamline efficiency and increase effectiveness within the workplace. Get Set before Joining your Meeting – Microsoft Teams’ new join experience allows you to select devices and our audio configuration prior to the call. Video preview enables a quick glance before your meeting starts. And if you are joining from a meeting room, you can easily connect your personal device with content only and no audio. Supported by a new modern infrastructure, Teams is built for the cloud on a highly-scalable microservices architecture that’s optimised with global peering points. As a result, attendees will see faster meeting join times and better overall experiences. But sometimes the unexpected happens, and Teams can quickly react to ensure your work continues. Share your ideas and make decisions faster by turning presentations into deep collaborative discussions. Attendees want to share material pre-meeting, communicate efficiently in the meeting, and reference decisions and deliverables after the meeting. Mobile Sharing – When you are on the go, not every meeting happens at a desktop. Now meetings participants can share photos, PowerPoint files, live video and mobile desktop from anywhere. Meeting Notes– Attendees can now easily take shared meeting notes during the entire meeting lifecycle. Share an agenda before the meeting, take notes during the meeting as well as find the notes (using the notes tab) after the meeting is over. The notes are co-editable by different participants and you can also @ mention people if you want to bring their attention to a specific note item. Meetings notes are also available on mobile! Meeting Recordings – Teams and Microsoft Stream offers the capability for meetings to be recorded and stored in the Office 365 cloud. The recording is available in the chat history of the meeting for easy playback so other team members can review later. Meeting recording (available in public preview) also gives users access to the transcript and search for keywords or phrases spoken during the meeting.